My name is Ron Drescher. 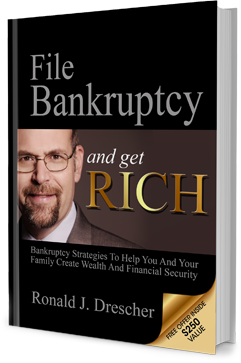 I’m an attorney practicing Bankruptcy and Creditor’s Rights in Maryland, Delaware, Pennsylvania, and Virginia; and today I want to talk about another reason to file Chapter 13 and it might be because you have a debt that’s not dischargeable in Chapter 7. Two perfect examples of that are debts when you pay your taxes by credit card or a debt that might arise if you have an intentional harm against the property of another. So for example, if you use your credit cards to pay taxes, that’s not dischargeable in Chapter 7; but it would be dischargeable if you completed a course in Chapter 7. But it would be dischargeable if you completed a course in Chapter 13, either 36 to 60 months. Similarly let’s say you do something intentional that causes harm to the property of another. If you complete the course of payments in Chapter 13, you’ll discharge that debt; that would be non‑dischargeable in Chapter 7. Now there isn’t a lot of application of these two reasons for filing Chapter 13, but it is good to know just in case something like that does come up for you. My name is Ron Drescher. I’m an attorney practicing Bankruptcy and Creditor’s Rights and if you have a question about whether you can discharge a debt in Chapter 13 please pick up the phone and call me. I would love to hear from you. Posted August 15th, 2016 & filed under Chapter 13.